I’m a big fan of 37Signals – the software business that makes the collaboration tools Basecamp, Highrise and Campfire. They’re a business founded on some simple principles, which revolve around giving the customer exactly what he needs (and nothing more), delivering insanely great customer service and being as open & honest as possible. These principles have been written up and expanded into “Rework”. 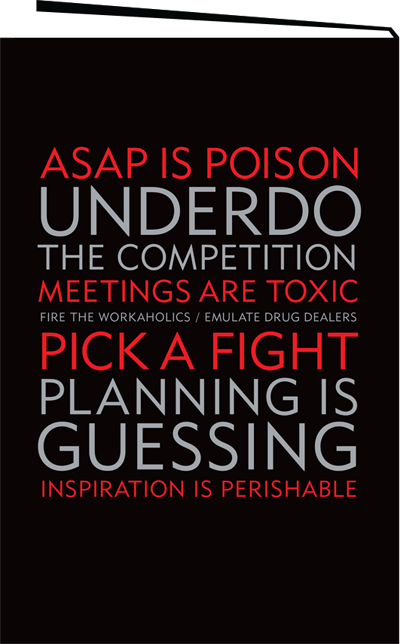 ReWork is a manifesto for a new way of doing business. I know, you’ve heard this before, right? But unlike many other similar books, it’s based on a real-life business (37Signals) that is doing all of this today. Practice, not theory, you see. ReWork is about forming a great work environment, building products that rock and over-pleasing the customer. It does it in bite-size chapters that pack a no-nonsense punch. Whilst it’s really aimed at the entrepreneurial business owner, it’s great for anyone with a desire to do business differently. I always enjoy books that like to challenge or shock (not sure if that’s really possible in a business book!) but with topics like “Meetings are toxic”, “Send people home at 5”, “Good enough is fine” and “ASAP is poison” you’ll find something in there to change at least a few of your work practices. As a marketer I particularly liked the section on focusing on your business and not on your competitors. It’s futile, say the authors, especially as competition changes all the time. Focus on your competition and you wind up diluting your own vision. Their advice is, even if you wind up losing, its better to go down fighting for what you believe in instead of just imitating others. Yes, reading this in rainy London means you take with a pinch of salt those US West-coast aphorisms, but this is one of the most enjoyable and transformative books I’ve read in a long time.